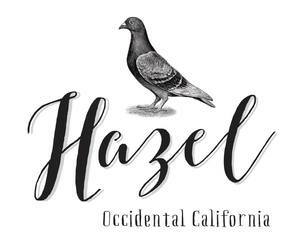 Restaurant Hazel will open in Occidental this summer. The chefs are most recently from Berkeley’s Zut! on Fourth. Courtesy of Hazel. Red Bird Bakery has opened in Santa Rosa, featuring sweets and stellar breads by two former Della Fattoria bakers. Photo: Heather Irwin. 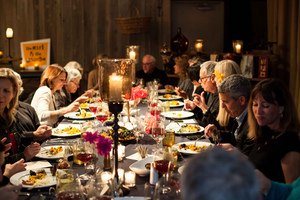 Suite D, a pop-up restaurant in Sonoma, will host an all-chocolate dinner on Saturday. Photo by Megan Clouse, courtesy of Suite D.
RKTO opens in the Trek bicycle store in Santa Rosa. Photo courtesy of Trek. Berkeley chefs Jim and Michele Wimborough of Zut! on Fourth are moving north to open ~HAZEL~, a wood oven-focused restaurant in Occidental. The couple are taking over the longtime Bistro des Copains space, which was for years a destination for French cuisine. The new “rustic California-Mediterranean” restaurant will make heavy use of the dual live-fire ovens, and the opening menu will include thin-crust pizzas, local fish from Bodega Bay, burgers, and small plates. As an alum of Boulevard, Kokkari, and Evvia, Jim is no stranger to wood-fired ovens. Michele will head up the desserts, including Friday Pie Day, as well as sundaes, cookies, and cakes. The couple are looking to open in mid-July; more details online. 3782 Bohemian Hwy., Occidental. Best. Sticky buns. Ever. Though veteran baker Linda Cermak says her buttery, caramel-topped buns are a bit sweet for her taste, we’re a whole lot in love with Cermak’s spanking-new patisserie, ~RED BIRD BAKERY~. 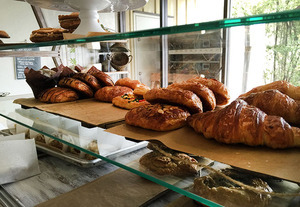 Hidden away in a Santa Rosa industrial park, the small bread, pastry, and cake shop Linda operates with husband Isaac is a dream that the former Della Fattoria bakers have leveraged their savings, their house, and their lives (baking starts at 2 am) to open. Having tasted through literally everything in their shop—from the aforementioned sticky buns to yeasty cinnamon rolls, crackling croissants (some of the best in Sonoma County), coconut shortbread cookies, and freshly baked baguettes and round boules—there’s no doubt that there’s something special happening in their kitchens, which an extra pound or two around my waist reflects. Literally part of the Della Fattoria family (Linda was married to the owner’s son), the couple have honed their craft to a science, questing for the perfect crumb and crust. One of their secrets? French butter. Made with a higher butterfat content and slightly fermented (or cultured), it makes all the difference in the flavor of their pastries. Another secret? Isaac won’t sell any loaves of bread he isn’t happy with, which by most standards would still be excellent. That’s how serious they are. It’s well worth searching out the Cermaks at their Santa Rosa bakery, or at the Saturday morning farmers’ market at the Veteran’s Building, the Petaluma evening market, or the Tuesday Novato market—all of which are at least 5,500 miles closer than Paris. Hours are 6:30am-2:30pm weekdays. Call ahead to make sure they’re not at a market! 3279 Dutton Ave, Santa Rosa, 707-521-9838. Nope, you’re not dreaming. Step into a Willy Wonka world of chocolate, chocolate, and more chocolate for dinner at ~THE GIRL &AMP; THE FIG~ chef Sondra Bernstein’s ~SUITE D~ on Saturday June 13th (that’s tomorrow!). The sure-to-sell-out Chocolate for Dinner event features a 10-dish cocoa extravaganza with top-notch chocolate from Valrhona, Vosges, Poco Dolce, and CocoaPlanet, including cocoa-rubbed baby back riblets, chocolate chile-dipped bacon, caramel-toffee potato chips, chocolate eggplant caponata, chicken with dark chocolate mole, and Italian zeppole with Belgian chocolate. During dinner, watch chocolate-themed movies, meet the owners of locally owned CocoaPlanet, and if you still haven’t had enough chocolate, a pop-up chocolate shop will also be there. Tickets $75 per person, all-inclusive with free corkage. For more info, go online or call 707-933-3668. 21800 Schellville Road, Suite D, Sonoma. 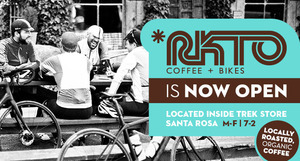 You can tell that Malorie, a popular barista in Santa Rosa, is tired of explaining what RKTO means. Standing behind the counter of the ~RKTO~ coffee/kombucha/tea bar that’s popped up inside the downtown Santa Rosa Trek store, she graciously gives it a shot, then turns it over to shop president Bret Gave. Apparently it means “great Northern bear,” as in the Bear Republic. As in California, he explains. Gave has hit on a trend that’s popular in Europe and is making its way into hip retailers across the States: putting a food and drink spot inside a retail store. In this case, RKTO is located within a high-end bicycle shop. “We’re creating a community space,” said Gave, who hopes to expand the coffee bar to include beer, an outdoor space, and eventually some sandwiches. He also hopes it will serve as a meet-up spot for bicyclists heading out on rides. Frankly, we’re more than happy with the current lineup of BiteClub faves, like Bella Rosa coffee, Straus milk, Republic of Tea, Red Bird Bakery goodies (see, they’re getting big! ), Revive Kombucha (on tap), and Guayaki yerba mate. Well, that and Malorie. Ten percent of the proceeds from the coffee bar will benefit local cycling advocacy groups. And as for the name? How about Really Killer Trek Osteria? Add your suggestion online at BiteClubEats.com. We’ll pass ‘em along to the baristas. Hours are 7am-2pm weekdays. 512 Mendocino Ave., Santa Rosa (inside the Trek Store).